Creepy, bloody, hilarious, and heartfelt. Everything we've come to expect from a King novel finally finds its way to the big screen. Bring on Chapter 2! Made for Stephen King fans, Pennywise/'It' fans, 'Goonies' fans, and horror fans alike. If anyone’s suffered a hit-and-miss collaboration with Hollywood, it’s Stephen King. They can’t all be The Shawshank Redemption, The Green Mile, Stand By Me, or even Misery or The Mist. But at least they’re not all cases of The Lawnmower Man. And it’s been a busy year for the man. Unfortunately, The Dark Tower and The Mist TV show didn’t leave their intended mark — The Dark Tower the lesser of the two evils — so at least we have Mr. Mercedes and director Andy Muschietti’s It. After losing director Cary Fukunaga, Muschietti was brought in to replace him and I’m not sure they could have possibly found anyone better to fill our favorite clown shoes. If one’s things for sure, Pennywise is back to terrorize a whole new generation. With a time shift from the ’50s to 1988, it’s October in Derry, Maine and raining cats and dogs. Bill (Jaeden Lieberher) is stuck inside sick, but his little brother Georgie (Jackson Robert Scott) demands a paper boat be made to go outside and play. 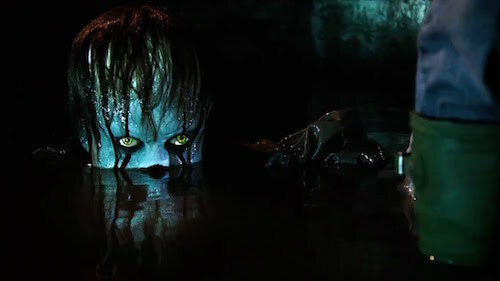 Things take a turn for the worse when Georgie loses his boat down a sewer grate and comes face to face with Pennywise the Dancing Clown (Bill Skarsgård). Cut to June 1989 and it’s the last day of school and Bill is trying to find a way to balance holding out hope that Georgie is still alive and enjoying the summer with his best friends Richie (Finn Wolfhard), Eddie (Jack Dylan Grazer), and Stanley (Wyatt Oleff). Soon enough, the friends find out that history has a way of repeating itself every 27 years and an ancient evil has come stalking. Now, the newly formed “Losers Club” — joined by tomboy Beverly (Sophia Lillis), new kid on the block Ben (Jeremy Ray Taylor), and outsider Mike (Chosen Jacobs) — must find a way to put a stop to the disappearing children of Maine before they fall prey next. Granted, they are condensing half of an epic book into a just over two hour film so corners were still cut. Mike and Stanley more than anyone, but everything else we could possibly want is here. There’s no holding back on the violence. Skarsgård is fabulous as Pennywise and gives it his all to creep us out every time he’s on screen. The Losers Club are all outstanding with more rapport than most teen movies over the last 10 years combined. Netflix’s Stranger Things borrows very heavily from It in the friends department, but they’re every bit as lovable here as they are on that show. I may have found Annabelle: Creation (which shares screenwriter Gary Dauberman) to be more on the scary end of the spectrum. But I’m more connected to It’s source material. I adore the novel and, of course, own the mini-series on Blu-ray — and have read just about every King novel connected to The Dark Tower — so I knew exactly what to expect. But It is one of the year’s best horror films and works even better when it’s focused on the Losers Club. And it also happens to be one of the year’s biggest joyrides as well. It has returned to find a new generation to sink its teeth into so come on down and buy a ticket and you’ll float too!